Vision Trip to Seattle – Day One and a bit more or less. Discover. With wonder I watch my four boys continue to discover life. In fact it is within each minute that new discoveries are uncovered in their lives. Kaleb, my three year old, has recently discovered Play-Doh, and can sit at the dining room table for hours on end creating and recreating and discovering “new” ways to make or destroy a creation. Kody, my six year old, is discovering the piano and at the same time history. Yes, history. He loves it. Kaden, my ten year old, discovered football this year. Not watching football but playing football. He is determined to be a quarterback when we get to Seattle. Konnor, my teenager-in-the-making, is discovering other things, things like the mystery of the female species, what a friend really is and a deeper concept of who Jesus was and is. One of the many amazing attributes of God is that he is unknowable. This doesn’t mean that we can’t know him, or that we cannot get close to him. It means that there will always be parts of him that we will be discovering. He will never be completely known. In other words, he will always be discoverable. His “discoverability” will never run out. It is our humanness that stops discovering and because we stop discovering we blame God for not being big enough. Wow there is a lot to talk about in there, but not here. A state of discovery is where Brandon and I were when we parked our rented Charger on the third floor of the parking garage on the Sound side of Pike’s Market, down town Seattle. 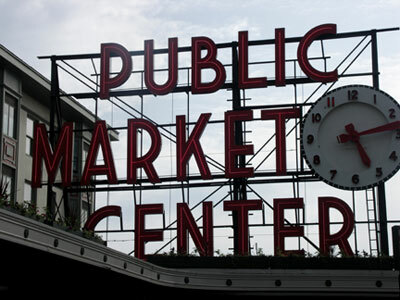 With a quick Market walk-through our souls hit the cobblestone on Pike Street. From that entrance into the city…we walked. The discovery of Seattle will take a lot of time but this initial jaunt down the streets allowed us to feel and taste and absorb the ethos of this unique city. We created Minnesota footprints down Pike Street from 1st Ave. all the way to 9th Ave. where we hung a left and wondered to Olive and back down towards the Sound. We found ourselves outside Mars Hill Graduate School, sweet place, and along side the Art Institute, and down allies and side streets as we peeked into shops, watched people and read graffiti. It was over an Alaskan Amber back at the Pike’s Place Bar & Grill that we started processing what we were feeling and sensing. Where would we start in our pursuit in discovering an area of ministering in such a huge city with so many different Ethoses? In the five hours we wondered through the city we saw such a small piece of the city. How will we possibly know where to go? How will we remotely dissect such a vast jungle of concrete, glass and steel. We will have to allow God to open the paths that we will set our feet upon. Our discovery of this tapestry will be directed by the Great Painter Creator himself. We will follow closely. It was following closely that many doors began to open, starting with the Jandas. Friday, the Friday before we left Minnesota, Randy Lawler called Pleasant Valley Church looking for Pastor Rick. I answered the phone so Randy talked with me. He asked in his Midwest American British accent how the church planting idea was shaping up. When I told him that we were going to Seattle, he gave us the name of Tony Janda. Tony had done a couple of trips to London with OM and Randy thought highly of him, so we called him up from the Seattle city center. Tony’s wife Candy answered the phone with excitement that God was moving people to transplant to Seattle to plant a church. 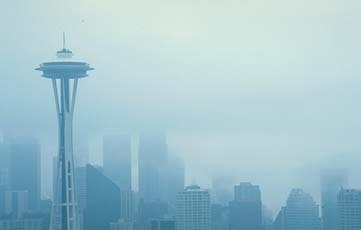 They shared with us that they had been praying for years and years that God would bring a revival to Seattle and asking that they could be part of it. When we arrived at the Jandas home in Renton, WA they welcomed us with open arms and freshly cooked Salmon and cuscus (the rice type of stuff, not the Australian possum type of creature). A family of five daughters and one son living on what seemed to be the edge of town but was instead a five acre chunk of land sitting in the city. What a blessing they were. That night, before Tony put us up in a hotel, they spent a couple of hours driving us around as they shared their heart for their city. They were passionate for people who aren’t living in the light; people who are trapped in the darkness. Desiring that Christians would truly be Christ to the neighborhoods. It was a rich night, a night that set up the rest of our vision trip. A night that began to speak the vision into the vision. We slept fast that night, anxious for what God would bring in the morning.